Information on the stained glass course content, starter projects and individual projects. Martin runs courses throughout the year; all courses are run with a maximum of twelve students ensuring that each student receives individual attention. Each student has use of a workbench with all the tools and equipment they will need while taking part in the course. All materials for the first two projects such as glass, lead and solder are provided by Martin (please note that students will have to purchase their own materials for individual projects). For your first project you will make a Tiffany stained glass window hanging, you will have the choice of a number of different patterns to choose from (see examples above). Each window hanging measures 17cm x 17cm or 20cm x 12cm approximately. Scoring and breaking glass to fit a pattern. How to apply copper foil tape to glass. Soldering (tacking / tinning and beading). 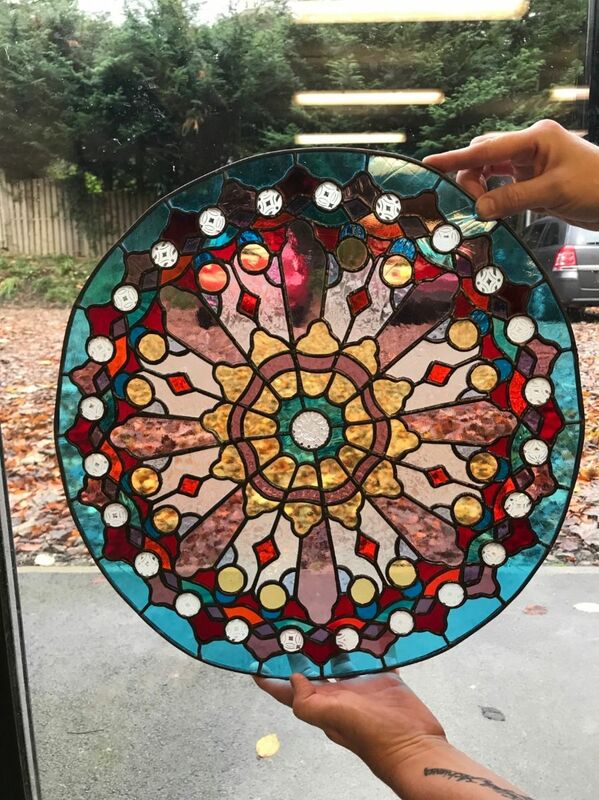 For your second project you will make a traditional lead stained glass window hanging, you will again have the choice of a number of different patterns to choose from (see examples above). Each window hanging measures 17cm x 17cm or 20cm x 12cm approximately. Once you have completed your Tiffany and traditional lead window hangings you can then move on to your own individual projects. Martin will work with you to select / plan and source materials for your individual piece, (please note that you will have to purchase the materials for your individual project). Most projects can be made the only constraint you have is time; it usually takes a student about twelve hours to do the first two projects. This means that each student usually as about twelve hours in class to complete their individual project. Martin will help you plan out your project to ensure that it is finished in the time you have available. Courses are available throughout the year and are available Monday - Friday (daytime and evenings) and run for ten, eleven or twelve weeks. If you are interested in attending a course, please contact Martin by phone or email using the contact section of Martin’s website. If you would like to join the email mailing list for future courses and workshops, please contact Martin. It is recommended that you bring reading glasses for close work. It is recommended that you wear sensible shoes (no open toed shoes) when attending the workshop. It is also recommended that you wear old clothes. This course involves working with lead, for safety reasons Martin recommends that pregnant women do not attend.